Emenike Makes Fenerbahce Debut as Yobo Scores in Season Opener. Nigerian striker Emmanuel Emenike made his Fenerbahce’s debut in a dramatic 2-3 loss to Konyaspor at the Konya Ataturk Spor Kompleksi (Konya) on Saturday as Joseph Yobo got his first league goal of the season. Super Eagles captain, Yobo, scored from a set piece, heading home an Emre Belozoglu’s precise cross from the left to help the visitors get in the lead in front of a partisan crowd. The encounter however ended in disappointment for Yobo’s Fenerbahce as three defensive errors gifted Konyaspor an unlikely 3-2 win. 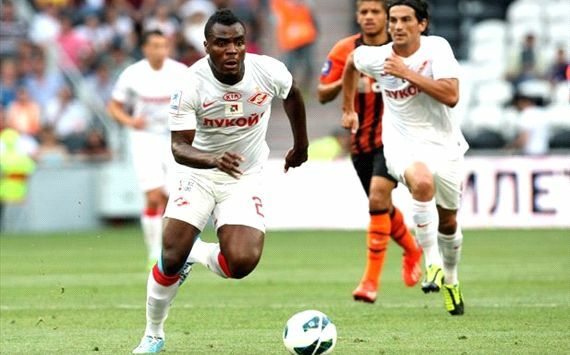 Emenike, who joined the Istanbul club from Spartak Moscow on August 7 for £11.2m, played the full 90 minutes but missed a flurry of goal-scoring chances on his debut. He missed a glorious opportunity in the 79th minute as his tame shot at Cameroonian goalkeeper Charles-Hubert Itandje failed to make any impact on the scoreline. The 26-year-old was unfortunate no to have won a penalty after a Mehmet Uslu’s push on the Nigerian was overlooked by the referee, Tolga Ozkalfa. Emenike and teammate Yobo will now look to improve rapidly on their Uefa Champions League play-off game against Arsenal this week. Glo Premier League: Bayelsa United Leads Three-Team Catch-Ups at the Summit. Previous articleNadal Wins Cincinnati Open, Replaces Murray as World Number Two. Next articleBolt Carves a Niche For Himself in the History Books.